December 10, 2018 - "Press Releases"
Industry Leadership: 45 years of industry leadership. 150 years of experience. 500 installed systems. Nobody can match our capabilities and expertise because nobody can match our track record. We pioneered many of the conveyance innovations in the cement industry, having served as a close working partner with cement producers and users since 1973. And our staff of industry experts—with more than 150 years of combined experience—has an in-depth understanding of what it takes to convey cementitious materials. We constantly bring forward new and better ways of handling and mixing materials to increase efficiency, productivity and profitability. From fully-integrated, customized systems to stand-alone components, we support the industry with a robust portfolio of products. Trusted Partnerships: The top 5 cement producers choose Cyclonaire for our In-depth industry expertise. Cement producers of all sizes, including Lafarge Holcim, Lehigh Hanson and other top-five industry leaders, rely on Cyclonaire pneumatic conveyance solutions. Here are just a few Cyclonaire technologies that will make it easier and more efficient for you to get the job done. CycloLift Connectors—Leave it to Cyclonaire to develop the industry’s leading connector for unloading hopper bottom railcars. CycloLift outperforms the competition, hands down. Within two minutes after a train is spotted, CycloLift is positioned, sealed and ready to work. It’s robust to accommodate virtually any material or environment, adjustable to precisely fit outlet configurations and auto-leveling to assure maximum functionality—all the features that guarantee the fastest, safest and most efficient performance. Semi-Dense Phase/HC Rail Unloading—This high-capacity conveyor transfers powdered materials with vacuum loading for bulk carrier, IBC and bulk bag unloading, and in-plant transfer applications. Features include side inlet vacuum loading for restricted headroom requirements. CB Series BlendVeyors—Increase efficiency by combining blending, weight batching and conveyance in one semi-dense phase unit. Blend/batch products from multiple sources to multiple destinations with accuracy and speed. Turbo-Inducers—Unload material faster from hopper-bottom pneumatic trailers and railcars. Convey material over greater distances. Dust Handling—We offer the most advanced filter media with cleaning processes that consistently maintain the unit’s peak performance. 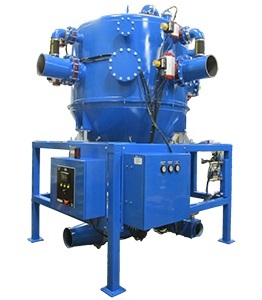 Our C&C dust reclaim system, bin vent dust collectors and filter receivers provide cost-effective and efficient solutions to keep plants dust-free. There are many reasons industry leaders choose Cyclonaire. Here are just a few of them. Fully-Assembled Modules—We provide a range of conveyance solutions, including “plug and play” options to make system integration simple, fast and accurate. Automation and Controls—Cyclonaire is an Allen Bradley Machine Builder partner. Controls can be custom designed for each customer’s application and fully tested to meet their needs. Whether it’s a stand-alone machine or fully managed plant process, we have the expertise and knowledge to make it happen. Parts Department—When we say we support you after the sale, we mean it. Our knowledgeable, experienced service technicians are readily available to answer questions, troubleshoot and secure critical information based on your needs. Tribal knowledge about materials and processes gives us rare insight into how to overcome any challenge. Customer Driven—Industry leaders of all sizes have counted on us over the years to move their business forward. Because our customers come first, our portfolio reads like a Fortune 500 roster. Diversity—Don’t waste time, money and energy working with multiple companies for your conveyance needs. We have you covered with a diverse portfolio of systems and products for dense, semi-dense and dilute conveyance approaches.